Clean air ducts are as important to your health and environment as maintaining tidy living areas and workspaces. In fact, scheduling regular duct cleaning appointments is one of the most crucial steps you can take to improve your indoor surroundings. According to the National Air Duct Cleaners Association, cleaning the ducts can boost air quality and even save energy. But how often should you be scheduling this basic service? Duration Between Cleanings: If the air ducts in your home or business haven’t been cleaned in a very long time, it’s important to schedule an appointment sooner rather than later. Chances are that some buildup occurred over time, and there may even be pests or mold living inside. An AC repair professional can inspect the air registers on your property for evidence that the ducts need to be deep cleaned. Allergies: It’s not unusual for some individuals to suffer from indoor allergies. They might manifest in the form of anything from sneezing to dry eyes to itchy skin. If those symptoms seem to arise every couple of years, it’s a good idea to schedule duct cleaning appointments more frequently to ensure that the air is as clean as possible. Residents: Finally, take into account the behaviors of the residents in the home or workplace. Are there smokers? What about pets that shed plenty of hair? These contaminants may cause the ducts to become polluted more quickly, thus increasing the need for more frequent cleaning appointments. Your AC repair contractor can provide you with a good estimation of how often is best for your property. 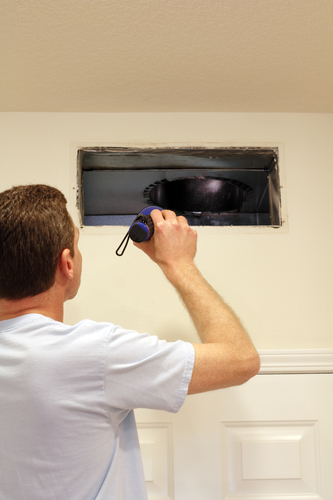 Whether it’s your first duct cleaning appointment, it’s important to make sure that your indoor air is clean. If you’re concerned about the air quality inside your home or workplace and want to improve both your environment and your health, contact your local AC and heating contractor today. Guelzow Heating & Air Conditioning is the leading source for AC installation and repair in Wisconsin Rapids, WI. In addition to offering 24/7 emergency service, they also provide reliable duct cleaning that can improve your indoor air quality significantly. Visit their website to learn more, or call (715) 423-1086.